Composed by Patty Hill, Mildred Hill. Arranged by Andrew Grenci, Cheryl Six. Children's Music, Birthday. Score. 1 pages. Published by Andiss Music (www.andrewgrenci.com) (S0.207213). 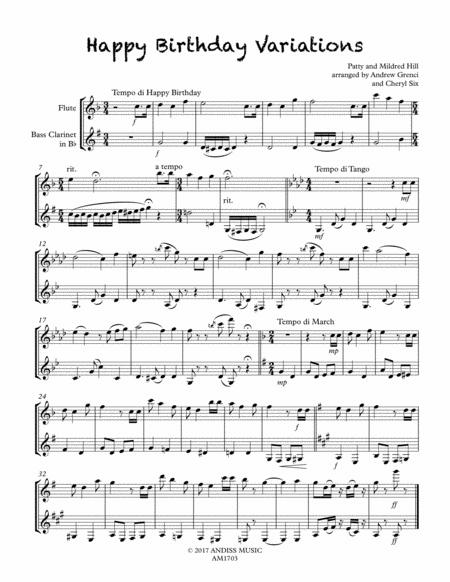 This is a fun and charming adaptation of "Happy Birthday" for flute and bass clarinet duet. (Also appropriate for flute and clarinet.) The arrangement begins with a traditional version of the tune, followed by variations. The first variation is a tango, the second a march. Both parts are printed on a single score sheet for ease of performance. It is perfect for any birthday party where live music is desired!